CSWP or Certified SolidWork Professional is acknowledgement given to personnel that have advance skill in SolidWorks modeling after passed the require examination. It’s the same as other professional field like CCNA (Cisco certified network associate) in computer networking and CSSGB (Six Sigma Green Belt Certification) for project management and process improvement in factory. What all have in common are; it stands you out from the crowd. Let’s get into perspective here. You go to jobstreet.com, type in ‘solidworks’ in search box, you will see how many job opening been listed as a result. If the first thing came into your mind is “Wow! I can easily get job now” then you are making a mistake. Nowadays, it means you have to fight your way through with other candidates that applying same job as you. Actually, it has to do with SolidWorks itself. Because the software is so easy to learn compare to other 3D CAD, more and more people have start using it over the year. Most companies that stepping from 2D designing to 3D more likely to prefer SolidWorks. They will need people working with it, but unfortunately one designer skill with SolidWorks is not the same as other, although both them, claim to have same years experienced using it. So this is one of the issue been facing lately. It affects both parties, the designer (employee) and the industries (employer). We go more details on both of it and explain how CSWP can overcome this issue. Fresh graduates listen up; you need to know that there will be at least 2 designers for every manufacturing company in Malaysia. Designer can also be a person assign as Mechanical Engineer, Design Engineer or R&D Engineer. People that graduate from Mechanical, Mechatronic, Industrial Automation & Robotic, Industrial &, Product Design field have possibilities been expose to SolidWorks during their studies will apply for that mention position. So unless you have a gifted mind, graduated 3.5 CGPA above in engineering, you will have hard time getting to big companies. This because there are a lot of candidates, so requirement of outstanding CGPA will act as the company hiring filter. That is why if you have a leverage, like CSWP, it will nullified that applied filter as employer notice that they no need to train you, saving time and cost, thus giving you higher chance to be recruited. So how about experienced people, especially the junior level, experienced around 3 4 years working with SolidWorks. Well other than that added spice to your resume, CSWP is a way telling your future employer that you have the necessity skill with SolidWorks. Backed up with your experience in modeling jig & fixture, mold or sheet metal, CSWP is a proof that you can take anything in your designing job. That is important, as the employer main concern is to know that you are ready, as there are ready. Employer are not psychic that can read people mind. All that they think during interview is “why should I hire this guy compare to a person before/after him”. You can tell them that you able can do this and that on SolidWorks during interview, but in the end, unless you have a good persuasion skill, having a proof is the only ticket for scoring a job. CSWP is your ticket! Last but not least, see how much people at US been getting with CSWP. 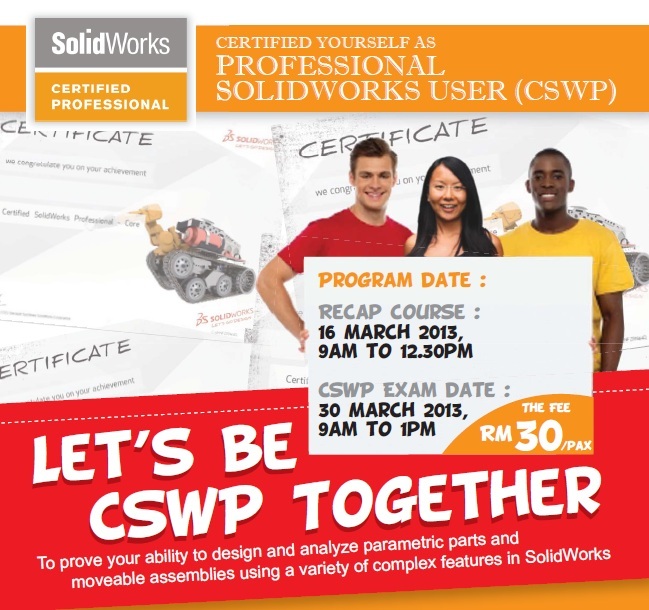 Take note that most of the companies that using SolidWorks in Malaysia are US base. So there bound to be almost similar salary expectation in Malaysia branch as well. 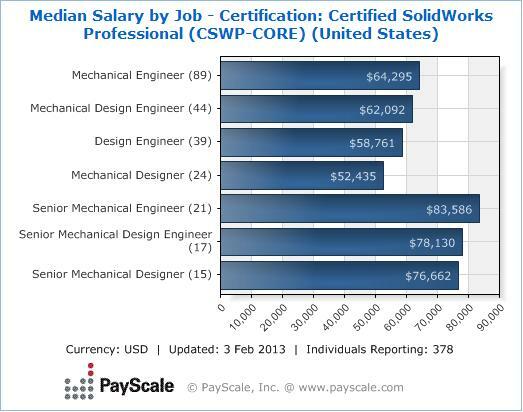 In any case, professional with CSWP been paid more compare to others! Got the idea? That’s all for today. Next post, we shall talk about how CSWP benefits the employer and more about CSWP. Finally, wish you a happy & prosperous Snake year. Working on cad modelling want to learn pro rendering which s\w is best and where to go learn rendering.